Any book a publisher or author gives you with the expectation that you review it, counts for this challenge. 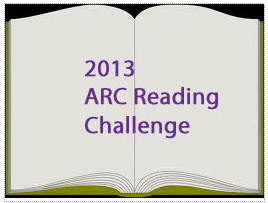 I should go for Platinum but hope to read/review 18 ARCs this year. Read the books and review them on your blog. If you don't have a blog, you can post your review on sites like Powells, Amazon, Barnes and Noble, etc. Please subscribe to my blog, as I will be doing a monthly post with MR Linky. Please add your reviews for each month in MR Linky in the monthly post. For your Name, please use this format Name: (Your Name, Book Title and Author's Name) for example: (Teddy, Obsessive Reading by Helen Reader). Please be sure to use the direct link to your review, not just to your blog. Then please leave a comment.